Unable to join us in person? We will be livestreaming the event! Follow the proceedings here, and join us by sending in questions and comments in real time via the livestream chat window! Livestreaming of the event will occur via the following link: https://new.livestream.com/accounts/3569780/events/2547173?cat=event&query=thinking+spaces (or search "Thinking Spaces) - viewers can send questions and comments in real time via the livestream chat window. 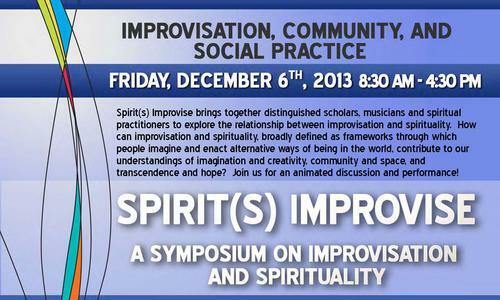 Spirit(s) Improvise brings together distinguished scholars, musicians and spiritual practitioners to explore the relationship between improvisation and spirituality. How can improvisation and spirituality, broadly defined as frameworks through which people imagine and enact alternative ways of being in the world, contribute to our understandings of imagination and creativity, community and space, and transcendence and hope? Join us for an animated discussion and performance on these topics! Click here to view the abstracts and bios for the keynote presenter and panelists. Stay tuned to this page for updates, speaker bios, and presentation abstracts! Michael Kaler (Ethnomusicology, York University) "Interplanetary Music: Sun Ra and Improvisation"
Gerard Yun (Music, University of Waterloo) and Luke Burton (Wilfrid Laurier Unviersity) "Beyond Traditions: Yogic Chant and Shakuhachi in Contemporary Improvisation"
11:15 – 12: 30 pm – Keynote Address: Jamie Howison, "Improvisation as an Act of Faith"
Ron East (School of English and Theatre Studies, University of Guelph), "Improvisation, Creativity, and the Imagination"
Lauren Levesque (Improvisation, Community, and Social Practice, University of Guelph), "Protest Music Performances as Methodological Frameworks for Re-envisioning Engaged Spirituality: Implications for Improvisation"
Ed Sarath (Music, University of Michigan), "Time, Sound, and Transcendence: An Integral View of the Improvisation-Spirituality Relationship"
For more details, please contact Lauren Levesque or Chris Tonelli at levesqul@uoguelph.ca and ctonelli@uoguelph.ca.